The expectations of Google investing $1 to $3 billion in a huge constellation of LEO-orbiting broadband satellites (reported by various outlets to be between 180 or 360 in number) is definitely concerning for ‘conventional’ FSS and BSS satellite operators, as well as the new kids on the block, such as O3b, Inmarsat’s Global xPress and Intelsat’s EPIC suite of satellites. Few of us can watch that remarkable scene in the movie Apollo 13 and not get inspired when Gene Kranz (played by Ed Harris) declares, “Gentlemen, failure is not an option!” The drama is stirring; but while drama is great in movies, it’s something nobody wants anywhere near satellites in the real world. 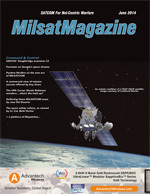 Several months of research led to the recent publication of Euroconsult’s Military Satellite Communications report. This research allowed us to enter into an unprecedented review of the use of satellite communication services and networks by military forces, and the future drivers for satellite use. Mission success is often defined as things going smoothly as planned, with no major upsets in achieving the desired outcome. For our customers, mission success is about the availability and reliability of the service they receive from Intelsat General. The time and cost benefits of commercially-hosted government payloads have been touted across the satellite industry for years, from payload and satellite manufacturers, to fleet owner/operators, system integrators, and even launch providers. With the reality of land mobile military demand decreasing due mainly to budget concerns as well as the effects of the Afghanistan drawdown, some recent deals may signal that civil government uptake could present tangible opportunities, thus softening the blow from milsatcom decline in most markets in the short/medium term. Space, long thought to be America’s final frontier, has transformed over the past several decades into a complex domain the Air Force must operate in safely.